James Noël was propelled to literary stardom in Haiti when his poem ‘Bon Nouvel’ was set to music by Wooly Saint Louis Jean in 2005. The charming Creole lyrics ‘cheri piga ou wont | si se la m-al remen-w | lanmou se chòvsouri | li jouke tèt anba’ (‘Darling don’t be embarrassed | if I fall for your feet first | love is a bat | that sleeps upside-down’), captured the island’s heart. Since then James has published a dozen poetry collections, a novel and a children’s book, and has received a number of literary distinctions at home and abroad. 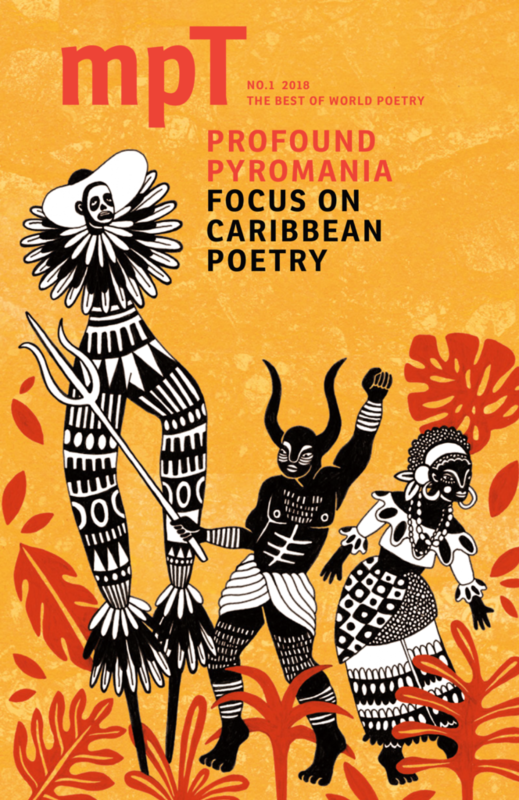 As well as writing himself, James is a champion for his fellow artists and in 2015 he compiled and edited an anthology of 73 contemporary Haitian poets, spanning four generations. Frustrated by Haiti’s global reputation as one of the poorest countries in Latin America (President Trump recently referred to it as a ‘shithole country’), everything James does is grounded in a determination to put Haiti on the global cultural stage. To this end, James founded Passagers des Vents (Travellers on the Wind), a literary and artistic residency in Haiti that aims to host minds from all over the world. In the wake of 2010’s devastating hurricane, James got together with artist Pascale Monnin and created IntranQu’îllités, a multifaceted cultural review that aims to ‘challenge certainties and set ideas’. IntranQu’îllités propagates rage as ‘the greatest form of mobilisation’ and this is reiterated in James’ own poem ‘Last Stage’ from the collection Poings chauffés à blanc (White-Hot Fists), ‘Here are my closed fists | for an openly declared fraternity’. Though founded in Haiti, the review considers itself a global movement with the island acting as its epicentre, rather than its centre. Haiti, for so long overshadowed by natural disaster, poverty and political intrigue, is entering a new stage of outward-looking artistic innovation, and James Noël is leading the way.